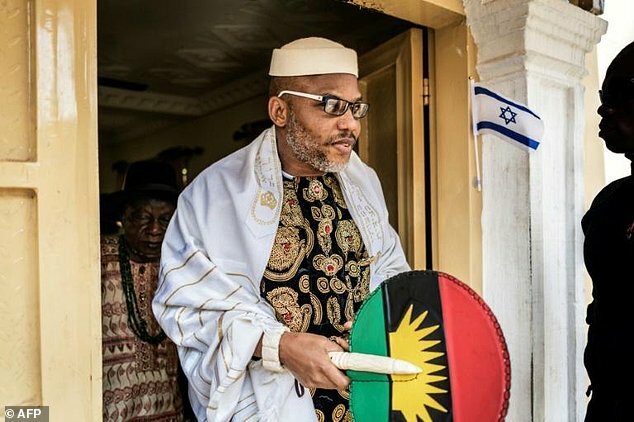 Nnewi – The Leader of Indigenous People of Biafra, IPOB and Director of Radio Biafra, Mazi Nnamdi Kanu, Wednesday said that the total compliance with this Sit-at-home directive he issued while still in Kuje Prison Abuja, has proven to him and Biafra agitators beyond every conceivable doubt that Biafra restoration is a priority to all and sundry. 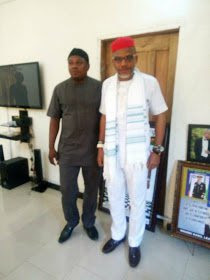 Former Vice President Alex Ekwueme and Independent People of Biafra’s leader, Nnamdi Kanu during Kanu’s visit to the former Vice President, in Enugu on Wednesday Kanu also promise never to let Biafra down, even upon the pain of death, since they have never let him down by their compliance, and therefore, will reciprocate their gesture by staking his life to the struggle,urging all Biafrans to join hands together with all genuine and sincere individuals and groups, to restore Biafra with truth and honesty. He thanked all the road transporters workers, teachers, civil servants, market leaders, artisans, clergymen, businessmen, traders, tricycle operators, motorcyclists, drivers, school children, parents and all the Biafraland, transport owners, women organizations, community leaders, youths leaders in every community, Wheel barrow/truck pushers for their support. “We also thank politicians who defied all odd and pressure from Aso Rock to make our sit-at-home order a memorable and resounding historical event. “I appreciate your enormous work because IPOB has made it possible in less than four years for every President and Head of State around the world to know about Biafra. “I also wish to acknowledge and appreciate the presence of international observers and foreign journalists who were on ground to monitor this epic historical event. 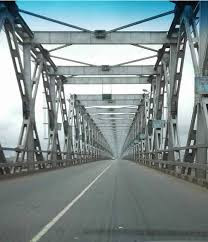 It demonstrates that the unique formula adopted by IPOB to restore Biafra is working. By the grace of Chukwu Okike Abiama, IPOB under our divine leadership will restore Biafra in no distant future.”. “This is also an evidence that our referendum will be 100% success and the beginning of what is about to happen in no distant time about restoration of Biafra, this is equally a lesson to the South East Governors and some few politicians who think that they are in charge, it is now clear to them that they are not, rather, the masses are in charge and they have spoken in an unmistakable terms. “MASSOB says thank you all Ndi Biafra and we will not fail to appreciate the transport companies like G.U.O Group, The Young Shall Grow, Ekeson Group, Uchenna Motors Limited, Ifesinachi Transport Limited and many other who complied with the directive. “We also thank the Keke drivers, bus drivers, Okada riders, the banking industries, the markets like Ogbete Main Market Enugu, Onitsha Main Market, Nkwo Nnewi Market, and all the markets at Aba, Owerri, Asaba, Port Harcourt, Nsukka, Awka and other parts of Biafra land that complied with the directive.